Brainspotting is a cutting-edge approach which works with the brain and the body to locate, process and release experiences and symptoms that are typically out of reach of the conscious mind. A brainspot is an eye position which is related to the emotional activation of a traumatic or emotionally charged issue. 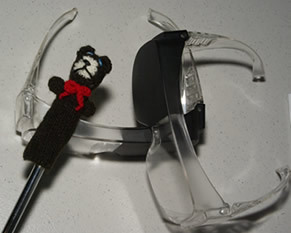 A pointer (sometimes softened with a finger puppet) and safety glasses with one lens blacked out help the client maintain focus on the spot.